VanGogh Gaming's TinyMiner & TinyMinerPlus Mining Bot - Features Page! This is a stand alone, professionally programmed Windows™ application, it doesn't need any third party programs to run! Many other macro mining bots out there (such as the ones which claim to be editable) are just text scripts that not only require third party interpreters but they also make you learn cryptic technical script languages in order to edit them. These third party programs can cost upwards of $50 dollars after a free trial period. You don't want that after you already paid a hefty price! Avoid these programs, they are much less human-like and much more detectable! TinyMiner doesn't need any installation, no need to clutter your registry, no need to install overbloated frameworks, just unzip the package to a folder of your choice and you're well on your way to making billions of ISK! It's super fast, optimized to consume almost no memory at all and you'll be amazed at how reliable and dependable it is! It works perfectly on all Windows versions (XP, Vista, 7, 8.1 and Windows 10). TinyMiner will Never need your EVE Online username or password and will never try to connect to the Internet so that it provides you with the ultimate peace of mind. Beware of eBay scammers who use macros to steal your EVE username and password and other valuable information stored in your computer! Do not place your EVE Online username and password in any macro and be especially wary if your firewall tells you that it tries to connect to the Internet! It's just NOT safe, you may never know what confidential information it sends away! Don't risk your account with other programs from untrusted sources! TinyMiner is the ONLY "EVE Online Macro Mining Bot" application that is Microsoft Authenticode® Certified! That means TinyMiner is digitally signed to ensure its authenticity and the peace of mind knowing that you are running a safe application! TinyMiner uses smooth mouse movements which are much more human-like. The program will slightly randomize the times for warping to belts and locking asteroids in order to mimic human activity and prevent detection. A generic HotKey (Ctrl-Alt-Backspace) is available for instant termination of the program! Hit it when you see the Boss coming your way! Also a new and convenient Pause button has been implemented. No more struggling to move the mouse against the macro! The mouse speed is adjustable from rather slow (for fast computers) to blazing fast (for slow computers). Don Vito Corleone, The Godfather, offers an Eve Mining Bot you can't refuse! TinyMiner has a simple, intuitive and easy to use graphical user interface. No programming knowledge required, no code to deal with. An easy to read status bar shows the "Total Runs" done so far, "Current mining cycle" and "Time left from the current cycle". Descriptive "Tooltips" have been added when you hover your mouse cursor over each and every TinyMiner option so that you can jump into the fray as soon as you take it out of the box! TinyMiner will warp to a random asteroid belt everytime (never the same belt twice in a row). 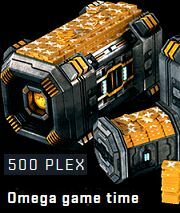 It will also remember which belts are empty and will no longer warp to them so that you don't waste precious time and risk being flagged by other players. This feature alone eliminates the risk of detection since you will never be in the same place for long. The program goes a step even further in terms of belt prioritization when it comes to optimizing your mining yield. Whenever asteroid belts become sparse TinyMiner will place them in a special back-queue and will prefer the other more plentiful belts whenever possible! TinyMiner will mine any type of ore - Veldspar, Scordite, Plagioclase, Omber, Kernite, Arkonor, Bistot, Crokite, etc, even ICE (it has special options for mining ICE)! Gas clouds (either cytoserocin or fullerite) vanish in no time when TinyMiner operates the gas harvesters! When an asteroid is depleted the program will re-lock a fresh one and continue mining. Furthermore it will reset lasers at configurable intervals of time which will increase your yield considerably since many asteroids can be depleted long before the 3-minute duration of strip lasers. TinyMiner supports any type of ship (exhumer, mining barge, industrial ship, frigate, cruiser, battleship, even the awesome industrial command ships like Orca and Rorqual) and any number or kind of mining lasers. It will always keep asteroids within mining range to maximize yield and will warp to a new belt if the current one runs out of ore. By approaching the asteroids that are farther away or warping to another belt when the current one is empty you will multiply your mining yield tenfold since TinyMiner will never waste precious mining time like most of the other robotic scripts out there. Each laser will mine its own asteroid thus dramatically increasing your mining yield, unlike other programs out there which set all lasers on the same asteroid thus wasting valuable mining time when the asteroid is depleted. TinyMiner provides an intelligent laser management feature. If a laser cannot be activated because its corresponding asteroid is out of mining range then the program will activate that laser on the first targeted asteroid which is always within range and so nothing will be wasted during that cycle! The program supports gang mining in a fleet to increase your mining yield even more. You can select if you're the fleet commander or a squad member and TinyMiner will behave accordingly. TinyMiner will monitor where the ship is and will react to unexpected situations, such as getting stuck next to an asteroid, arriving to an empty belt or not docking at the station. It will also defend the ship by launching drones and activating modules of your choice (shield boosters, armor repairers, active hardeners, etc). Other features include using the Overview to locate the asteroids (Not the Scanner) and automatically closing the server shutdown information windows that get in the way of normal mining operations. The comprehensive illustrated tutorial provides for an easy setup. Descriptive and easy to understand instructions and screenshots will get you up and running in no time at all. 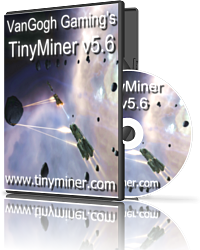 TinyMiner is compatible with XP, Vista, 7, 8.1, Windows 10 and all the latest EVE Online expansions and patches including the last one, April 2019 update! A full one year of free upgrades and continous support goes without saying! Whenever the next version is released, all existing subscribers get it for free. The current released version of TinyMiner is v5.77 which means we have already released dozens of updates and we're still developing and improving this tool. If you were with us from the first version ever released, just imagine the value of the dozen updates that you got for FREE and will continue to do so throughout the entire life cycle of this product. A generous "try before you buy", fully-functional, free trial version is readily available - evaluate it for as long as you want, it is not limited in any way. We believe our TinyMiner mining tool has an exceptional value. We think you'll be completely satisfied with the features and reliability of our product and we work very hard to make sure that is true. If you ever have a question or problem with our tool, we always encourage you to let us know so we can help solve that problem. You will also benefit from free access to the members-only area of our Forums where users can always download the latest version, share experiences, ideas, ship setups, request new features, get help and much more. Our Forums have both a public area and a private area to protect your conversations from prying eyes! Many new and exciting features have been added to TinyMiner over the course of time and a lot of them were suggested by our forum users. The latest additions can be found on the next page!